Praia da Marinha ("Navy Beach"), in the Algarve region of southern Portugal, has long been popular with locals and holidaymakers alike. Frequently seen in global advertising campaigns, the combination of towering cliffs, golden sand, and clear waters make it no surprise that Praia da Marinha is not just one of the best patches of sand in Portugal. The authors of the Michelin Guide consider it to be one of the top 10 beaches in Europe and one of the top 100 beaches in the world. It’s a little isolated, however, and facilities are relatively limited, so requires a little effort to ensure an enjoyable visit. We’ve put together this complete guide to Praia da Marinha to help you plan your trip, including the best ways to get there, which services are available, and what else there is to do there once you’ve had your fill of sunshine and sand. Where is Praia da Marinha? Praia da Marinha sits at the end of a small road about 20 miles east of Lagos, and 15 miles west of the popular resort town of Albufeira, towards the center of the Algarve coast. Why Visit Praia da Marinha? While most visitors to Praia da Marinha are there for the usual beachside activities of sunbathing and sandcastle-making, there are several other reasons to visit. The limestone rocks are probably as famous as the beach itself, especially the giant M-shaped formation that juts out into the ocean on the right-hand side, clearly visible from the clifftops. The calm, crystal-clear waters are full of fish and other marine life like octopus and sea anemones, with good snorkeling just offshore. Be sure to bring your own equipment, as there’s nowhere to rent or buy it on the beach itself. The scuba diving is also good there, although since there are no dive shops in the immediate area, you’ll need to see which trips are available from the dive shops in Albufeira, or be fully self-contained. If you’d rather be above the chilly water than in it, take a boat cruise from the beach to explore the nearby caves and small beaches that are otherwise difficult or impossible to get to. You can also explore some of them on your own, but pay close attention to the tide, as you’ll quickly get cut off from the main beach when it starts to rise. There’s also a 4-mile walking trail along the cliffs above the beach to the nearby town of Carvoeiro, with excellent views over the ocean and nearby coves. There’s little shade, but as long as it’s not too hot, the walk is well worth doing. Despite its fame, Praia da Marinha typically isn’t as crowded as you might expect, due largely to its relative inaccessibility. There’s no rail service along the coast of the Algarve, and hardly any buses run past or near the beach. While it’s possible to walk there along the clifftop path from Carvoeiro, it’s too far from the larger towns to comfortably get there on foot or by bicycle. As a result, taxis and private vehicles are the most sensible option for many visitors. Expect the drive from Lagos to take around 40 minutes on the A22 toll road, or a little longer on the shorter, but slower, N125. If you’re coming from the east, it takes around half an hour on the A22 from Albufeira, or a few minutes more on the more-scenic M526. There is ample car parking along the road at the top of the cliffs. A taxi from Lagos costs approximately 40 euros, or 30 euros from Albufeira. If you choose to take a taxi, be sure to arrange a pick-up time with the driver, or at least have the number to call when you want to return, as there may not be any drivers waiting near the beach when you’re ready to leave. If you really want to take public transport, consider taking a bus from Lagos or Faro to Lagoa . From there, a bus runs twice a day to and from Praia da Marinha on weekdays, once in the morning, and once in the afternoon. It doesn’t run on weekends. Note that the long staircase down to the beach is quite steep in parts, so you’ll need to pay close attention to small children. The descent is difficult with a buggy and isn’t appropriate for wheelchairs or the mobility-impaired. 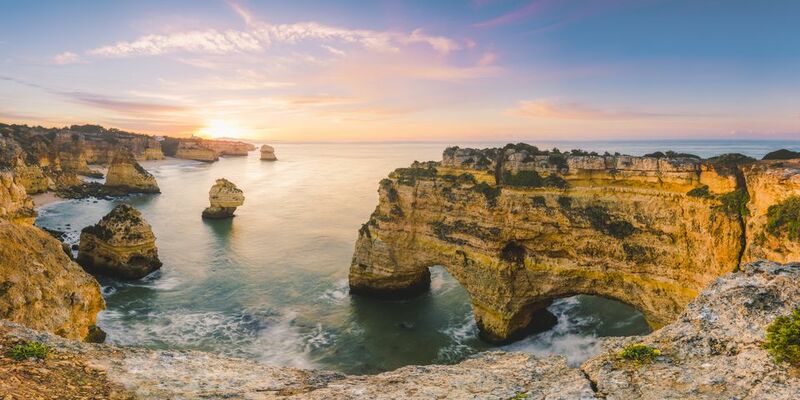 For those more interested in the perfect Instagram shot than spending hours at the beach, several tour companies include Praia da Marinha in their day trips from various towns in the Algarve. You won’t get to spend a great deal of time there, but it’ll be long enough to snap a few (dozen) photos. During the summer season (June through August) a small restaurant sells expensive drinks and snacks and has toilets available, but there are otherwise no facilities on the beach itself. Vendors often sell water and drinks at the top of the path, but again, typically only during summer. It’s well worth bringing your own food and drinks with you if you’re visiting at other times of the year, or plan to spend all day at the beach. As with elsewhere in Portugal, there’s no problem with drinking alcohol in public places—just remember to take any trash with you when you leave. If you’re looking for facilities like sunbeds and umbrellas that are standard at larger beaches in the Algarve, you’ll need to look elsewhere or bring your own—there’s nowhere to rent them at Praia da Marinha. Take a look at the tide timetables before heading out, as it’s not the largest beach at the best of times, and is reduced to a relatively narrow strip of sand when the waves roll in. In the peak of summer, you’ll have more space to yourself at low tide. It's also safer, since the cliffs are a little unstable, and you don't want to sit too close to them in case of falling rocks. On the flip side, if you’re planning to take a boat trip, aim for high tide so you can get closer to the cliffs and caves.